Michael Schenker (born 10 January 1955, Sarstedt, Lower Saxony) is a German rock guitarist, best known for his tenure in UFO, in addition to his solo band. He first rose to fame as an early member of the Scorpions, then achieved fame in the mid 1970s as the lead guitar player for UFO. Since leaving UFO in 1978, he has been leading the Michael Schenker Group in various incarnations. He is the younger brother of Rudolf Schenker, who is still a guitarist with the Scorpions. His career has had many ups and downs, partly due to a long history of alcoholism and personal problems; still, Schenker continues to perform and record and to maintain a following, and is called "a legendary figure in the history of metal guitar." 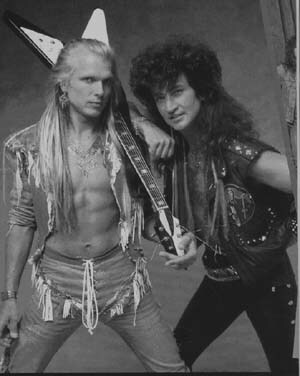 I finally picked up the first McAuley Schenker Group album Perfect Timing. I have never really listened much to what Michael did after Gary Barden/Graham Bonnet era of M.S.G. I have to admit I really have missed out something there. A little more on the melodic and commercial side, but he does it with class and style. His guitar playing is as always on albums, flawless.